It all comes down to making shots and for Oregon, the shots stopped falling at the worst possible time. The Ducks just couldn’t find any offensive rhythm in the second half and was denied the program’s first Final 4 appearance as Notre Dame came away with an 84-74 win. The Irish advance to Columbus and will face UConn in the National Semifinals. As for Oregon, it finishes the season 33-5, its best record ever. Even as the disappointment settles within the players and fans, hopefully that feeling will turn into astonishment when one looks at where this program was just four seasons ago. The Ducks were coming off a 4-27 season and now under five years, Oregon has been two straight Elite 8’s and with nearly everyone back plus another impressive recruiting class, a Final 4 is certainly within reach. Notre Dame won the game in the third quarter when they held the Ducks to just nine points and turned a 46-40 deficit into a commanding 61-54 lead. Usually a seven-point lead isn’t a lot, but the Ducks made just 3-of-17 from the field in that decisive quarter. Sabrina Ionescu led Oregon with 26 points, but was just 1-of-8 in the second half. Ruthy Hebard scored 17 and brought down 10 boards, but just five points and one rebound came in the second half. Rebounding was the key as the Irish pounded Oregon 51-29 on the glass and 19 of Notre Dame’s rebounds came on the offensive end, good for 26 second chance points. Another stat that’s unusual for Oregon is that the Ducks were credited with just 11 assists as a team. Ionescu usually has 11 assists on her own. Oregon played from behind for much of the second half, but when Ionescu found Hebard on a fast break lay-in, the Ducks were within two at 65-63 with 5:45 left. Notre Dame went on a 6-0 run to extend the lead to eight and that was the nail in the coffin. After hitting three of their first four shots from long range, Oregon made just one of its next 11 from behind the three-point line. In the first half, it was a completely different story. The first quarter featured a feeling out period and not a lot of defense as Notre Dame took an early 22-21 lead. Both teams made hay down low and Oregon didn’t even attempt a three-pointer in that initial 10 minutes of action. What was working, however, for the Ducks was Hebard making easy shots down low and Ionescu making 15-foot jumpers. The Irish managed to get the ball inside against the Ducks’ soft zone and wound up with a two-on-one down low. But when the second quarter began, the Ducks made some adjustments. Satou Sabally suddenly found her stroke from long range, hitting two treys, to give Oregon a 35-33 lead. The Pac-12 Freshman of the Year was 0-for-5 on threes in the Sweet 16 win against Central Michigan. On the other end, the Ducks’ zone buckled down and caused some turnovers, which led to easy baskets. Lexi Bando’s steal and lay-in, followed by Ionescu’s lone three in the first half gave Oregon a 46-37 lead with 46 seconds left. Oregon shot a blistering 59 percent from the field on 20-of-34 shooting in the first half, while Notre Dame shot 49 percent (17-of-35). Now the off-season begins and coach Kelly Graves will retool this team, but he won’t have to retool a lot. Oregon loses just Bando and Justine Hall to graduation and will add point guard Taylor Chavez (No. 60 ESPN) and Sabally’s sister Nyara, a 6-3 post player. Transfer Erin Boley will also join the team. Boley, a 6-2 forward from Notre Dame, was the 2016 Gatorade National Player of the Year and will have three years of eligibility remaining. 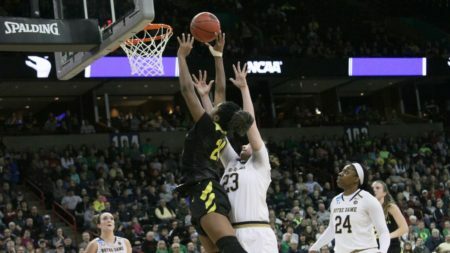 The post Ducks Falter in Second Half, Fall to Irish 84-74 In Spokane Regional Final appeared first on DuckNews.com.